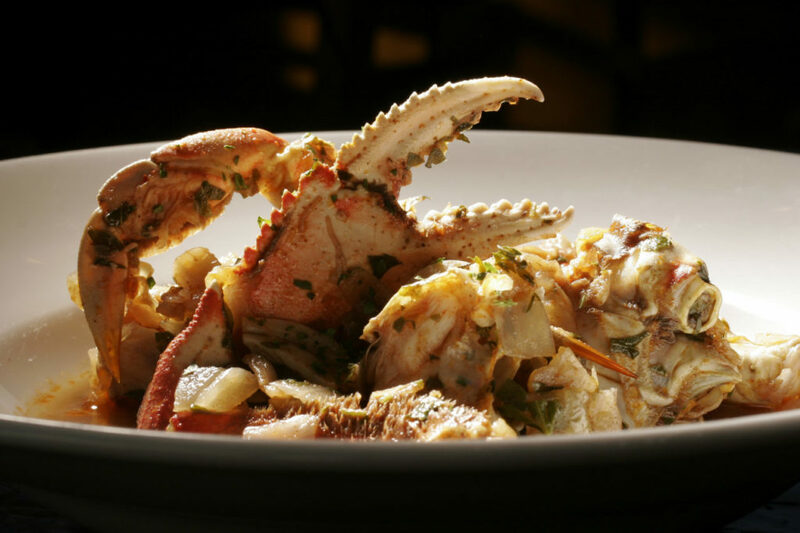 Five local chefs share recipes starring Dungeness crab. 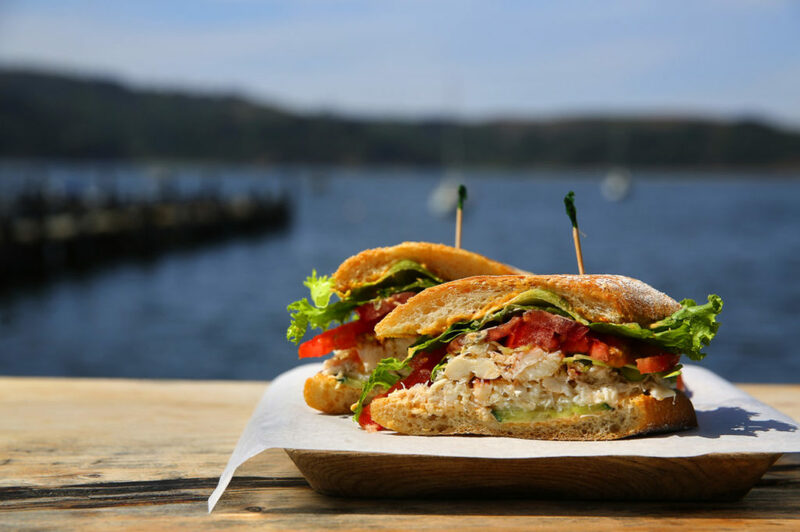 Find the recipes below and click through the gallery for some of our favorite Dungeness crab dishes on local restaurant menus. In the spring, swarms of baby Dungeness crabs float through the protected, shallow waters of North Coast bays like so many tiny stars in a far-off galaxy. But when winter arrives, the mature, male crustaceans fattening up in the eelgrass off the coast become the region’s true culinary stars. After being steamed and cleaned, the crabs’ hard shells are eagerly cracked open, exposing mounds of moist and delicate flesh whose subtle sweetness pairs well with butter and tomato sauce. 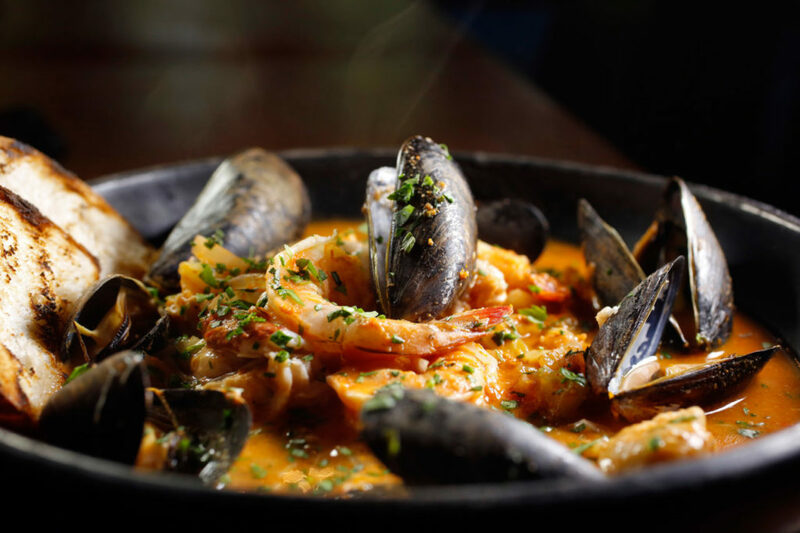 Those flavor pairings have been immortalized in such Bay Area classics as Crab Louie Salad and Crab Cioppino. 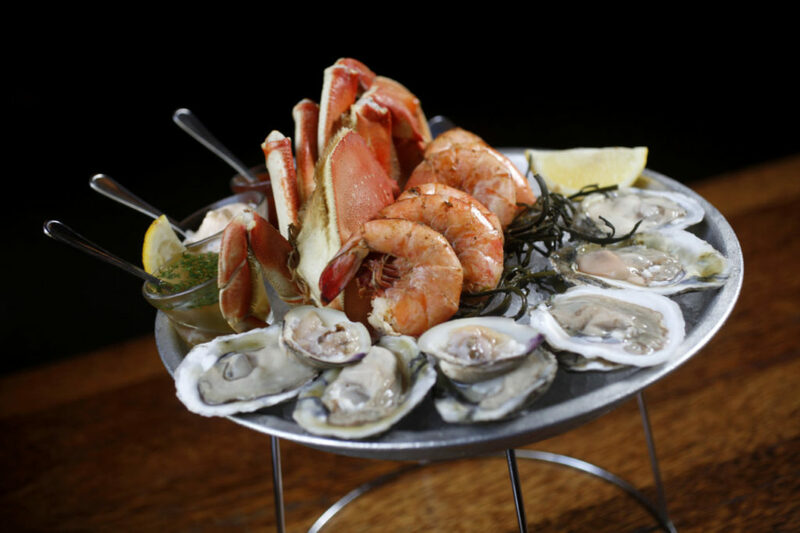 Here in Wine Country, many of the region’s best chefs grew up on other shores enjoying other tasty crustaceans. But once they taste the meaty Dungeness, caught in the chilly waters off Northern California, Oregon, Washington and Alaska, they’re hooked. Find a few favorite recipes from Sonoma County chefs below, and click through the above gallery for local places to enjoy the winter treat. 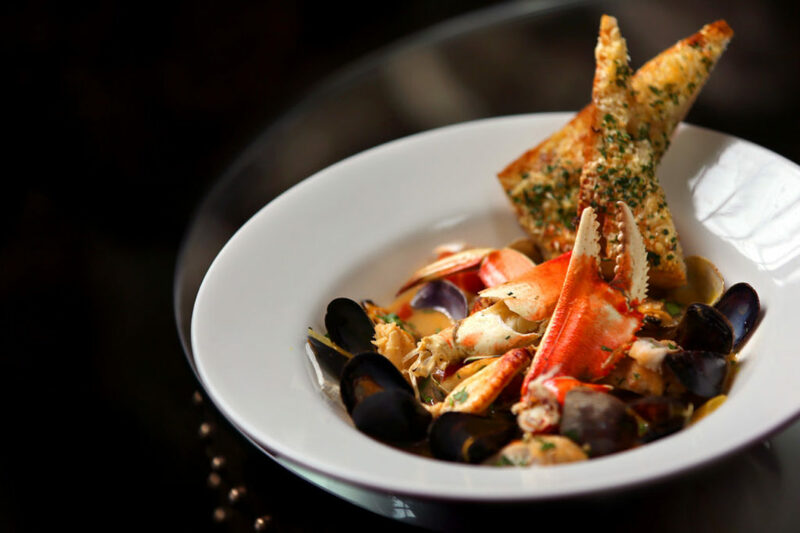 Justin Wangler, Executive Chef at Jackson Family Wines, makes this recipe for boiled, cracked crab at home, alongside a chili sauce and the traditional melted butter. “It’s just a nice, Sonoma County wintertime meal,” he says. 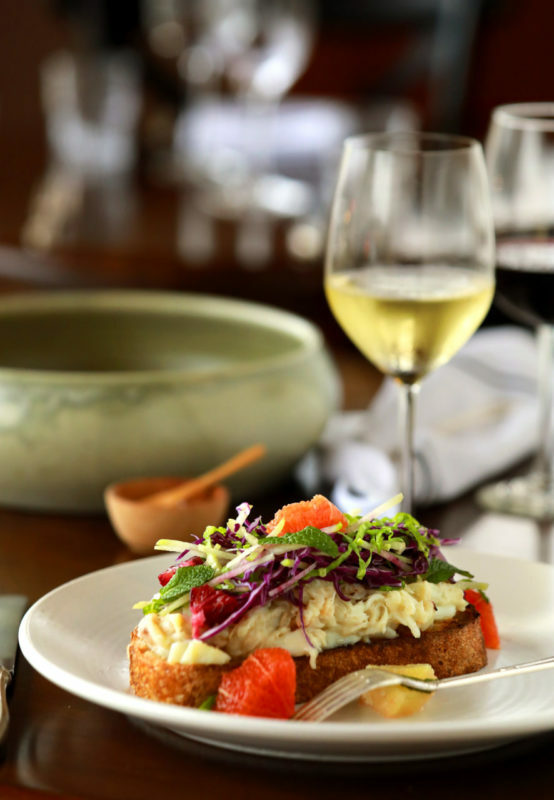 “Sharing it with friends spreads the work around, and you can all crack it together and drink wine and have fun.” The sweetness of the crab, especially when dipped in butter, goes perfectly with the rich texture of the Kendall-Jackson Vintners Reserve Chardonnay. “That’s a no-brainer,” he says. Wangler prefers to start with live crab — the fresher the better. “You want to make sure they are feisty and moving around,” he says. “You don’t want one that’s slow.” When serving the crab, he uses Joyce Chenscissors to cut through the shells, for easier eating. 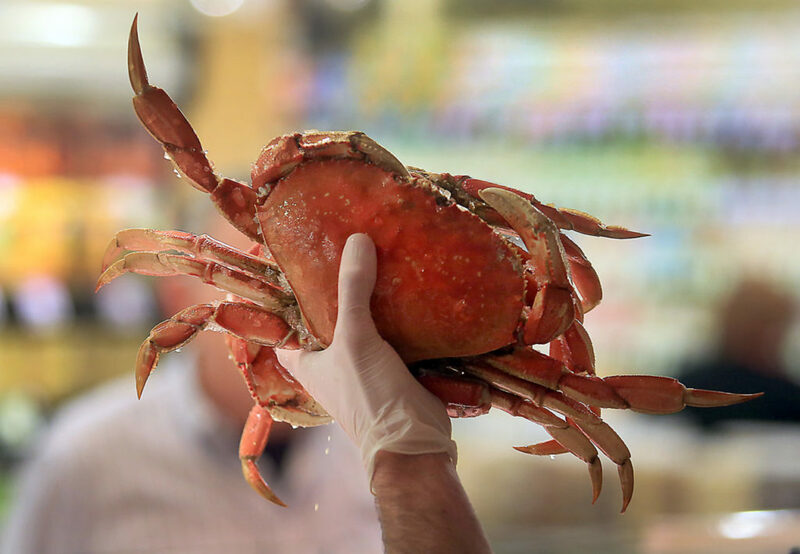 3 (1½-pound) Dungeness crabs In a large stock pot, add water, vegetables, bay leaf, parsley and salt and bring to a rolling boil; reduce heat to a simmer and cook for 20 minutes. Add the wine, lemons and white vinegar; cook for 10 minutes. Add the crabs, return to a boil and cook for 13-15 minutes. Carefully remove the crabs from the stock pot and shock in an ice water bath. If serving the crabs warm, skip the ice water bath and serve with melted butter. Put the first five ingredients in a heavy-bottom pan and reduce until thick. Add the lemon juice and blend together. Mix relish, mayonnaise and chili sauce in a bowl. Whip cream with brandy until it forms soft peaks. Combine whipped cream with the mayonnaise mixture, chopped parsley and salt and pepper. If the crab is purchased live, bring a large pot with enough water to cover the crab to a boil. Using large tongs, carefully place the crab in the pot and boil for 15 minutes. Pull them out of the pot and place in an ice water bath to cool quickly. Once cooled, twist off the legs and claws and then pull away the apron (the underbelly). Now separate the carapace (the main shell of the body) from the body to reveal the spongy gills and crab butter — the innards of the crab including the fat attached to the carapace. Remove and discard the gills. Scoop out and save the crab butter. This is essential, as this butter imparts a rich crab flavor to the stew. 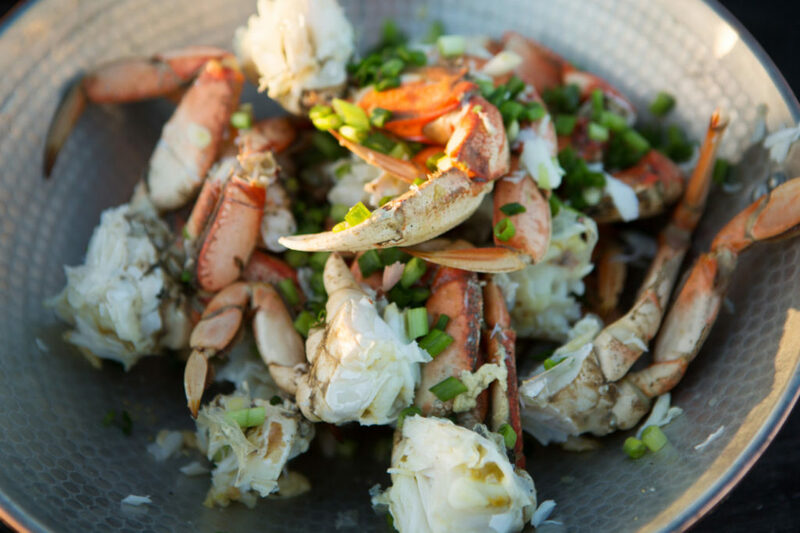 Squeeze the collected crab butter through a fine-meshed strainer. Clean each crab body under running water and cut it into 6 pieces. Crack the legs enough to create a little space for the sauce to penetrate the shell. Collect the body, legs, claws and butter and set aside. Discard the carapace and strained-out material. Heat the onion compote, sea salt, Portuguese spice blend, paprika, piri piri, bay leaves, wine and parsley in a medium pot with a lid. Add the cooked crab, including the strained crab butter, and steam in the covered pot for about 5 minutes to heat through, gently stirring often. If the stirring is too vigorous, the crab tends to fall apart and look messy. Turn off the heat and allow the pot to sit covered for at least 30 minutes before serving, to ensure the crab absorbs all the flavors. Give the stew a gentle stir every 15 minutes to coat the legs and claws with the other ingredients. Sauté all the ingredients in a medium pan over low heat until the onions are a light golden color, sweet and void of pungent onion flavor — approximately 1 hour. Store up to five days in the refrigerator. Place the cumin, allspice and cloves in a sauté pan over medium heat and cook, stirring, until fragrant and lightly smoking — about 5 minutes. Allow to cool, and grind in a spice grinder. Add the cinnamon and grind again. Combine the ground spices with the paprika and grated nutmeg, mix well and store in an airtight container for up to six months. Every holiday season, Madrona Manor Executive Chef Jesse Mallgren celebrates 18 days of Christmas with a popular series of Dickens Dinners featuring a traditional English menu of Beef Wellington and Christmas Pudding. 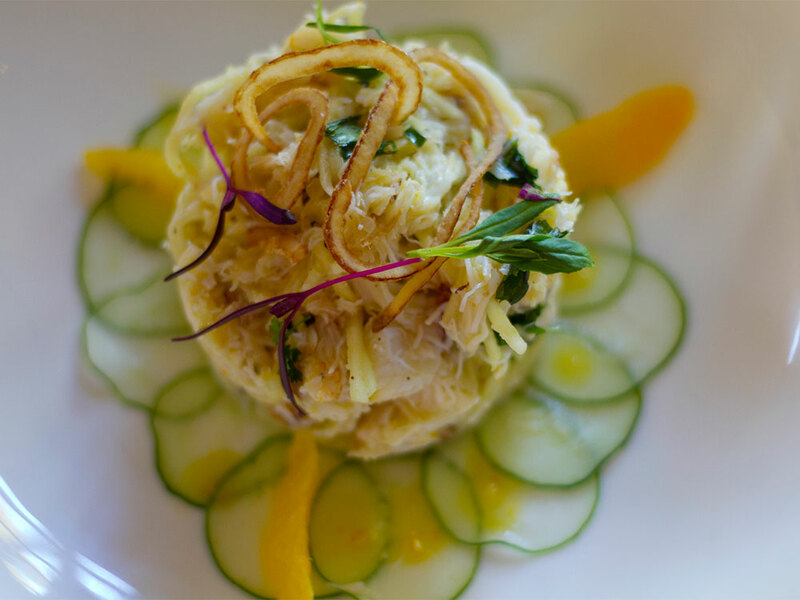 Mallgren also provides a taste of the Sonoma Coast with an elegant Dungeness Crab Salad made with winter greens like frisée and radicchio, plus mandarin oranges grown in the Healdsburg inn’s garden. The crab is gently napped with Green Goddess dressing, which adds an herbal flavor, while the greens are dressed in a fresh orange vinaigrette. For orange vinaigrette: Whisk reduced orange juice, vinegar and salt until salt is incorporated. Slowly whisk in the olive oil. For Green Goddess dressing: Whisk together the mayonnaise, herbs and vinegar. Chef Lisa Lavagetto of Ramekins Culinary School always makes Crab Eggs Benedict during Dungeness season for brunch for family and friends. As a shortcut, she learned how to make a hollandaise sauce in a blender, which helps streamline this labor-intensive dish and get it to the table with less stress. Poach a dozen eggs in advance in a segmented poaching pan to a hard-white/soft-yolk stage and place them in a cool water bath in fridge; you’ll reheat them before serving (instructions below).Prepare the hollandaise sauce and add about 1 tablespoon of the fresh dill, chopped finely. Set aside. Preheat the oven to broil. Halve the English muffins, place them on a baking sheet and lightly toast them under the broiler. Remove muffins and reduce heat to 350 degrees. Place the cooled eggs in the 350-degree oven to heat them through (about 10 minutes). Meanwhile, mix the cream cheese with the smoked salmon and then spread the mixture over all 12 muffin halves evenly. Top with a thin slice of tomato and a 12th of the drained crab meat and place the baking sheet in the oven for about 5 minutes to heat through only (not cook) as the eggs finish heating. When all are warmed through, top the muffins with a poached egg and spoon hollandaise sauce over the top. Garnish with the asparagus. Place egg yolks, salt, pepper and cream in blender and blend for a few seconds at high speed until you have a smooth, frothy mixture. Still going at high speed, start adding hot butter in a thin, steady stream, not too slowly. As you add butter, the sauce will thicken. When half the butter has been added, add the lemon juice or vinegar. Then continue blending until the rest of the butter has been added.